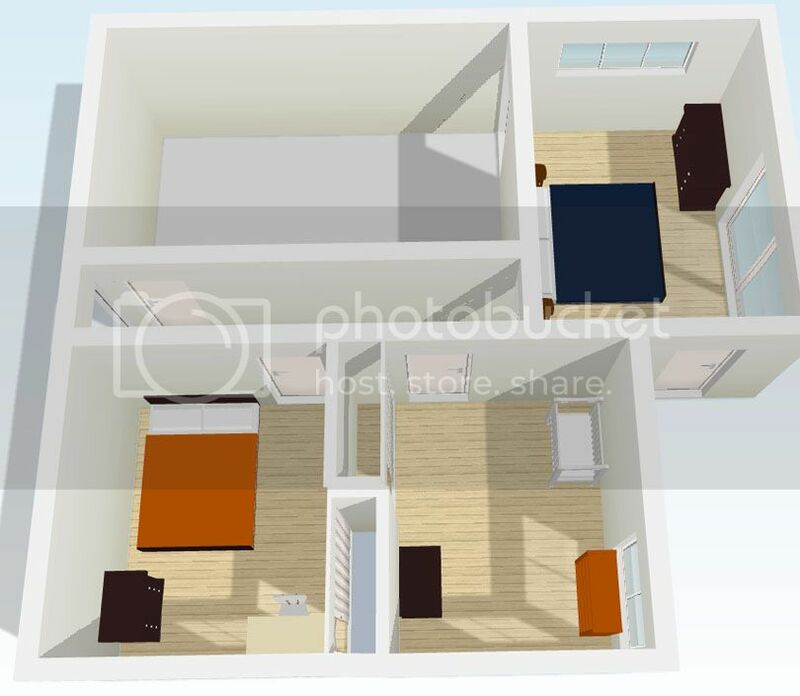 Certainly not as much fun as our kitchen & living room renderings, however, still exciting to have it laid our like we'd like it, I share with you the bedroom & bath layout ideas. I walked through this with one of the builders we are considering just yesterday and he thinks it will work well, which is always great to hear when you think it will fit, but just not sure. 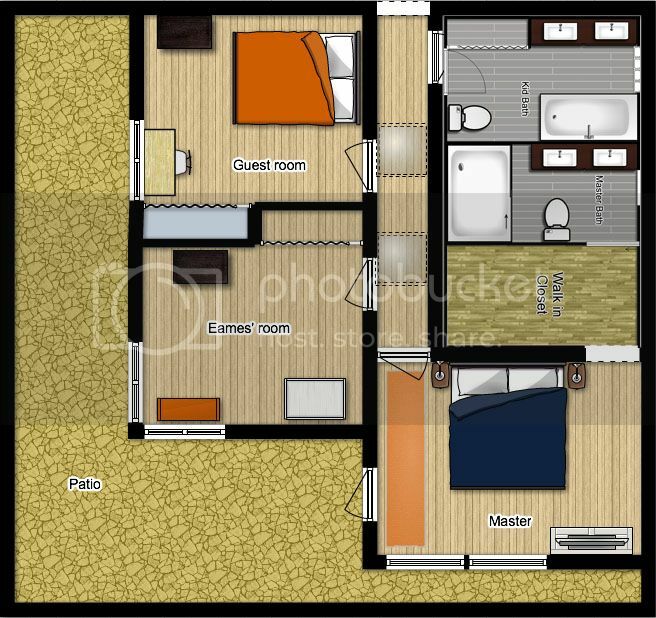 There are three bedrooms and there will be two baths. 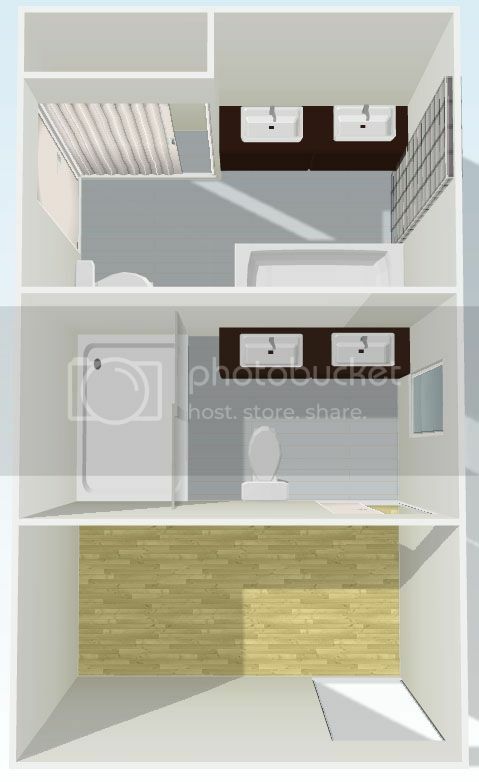 Originally, there was one large bathroom with laundry room inside the bath, and a closet with mirrored doors in our bedroom, but that will become two much smaller bathrooms, and one walk in closet for us. The laundry room will be moving into the garage, which I will do my best to explain in a later post of how that will work. Although I love a nice, hot shower, Greg and I do not spend a lot of time in the bathroom, so large baths were not important to us in this house. We also are making our master bedroom a few feet smaller, to accommodate a larger master closet. We are in the mindset that less furniture = less clutter/less dusting, and having all of our clothes, including our folded items such as socks & pajamasin the closet is ideal for us. We are currently not "TV in the bedroom" people, but are considering it in this house for various reasons. 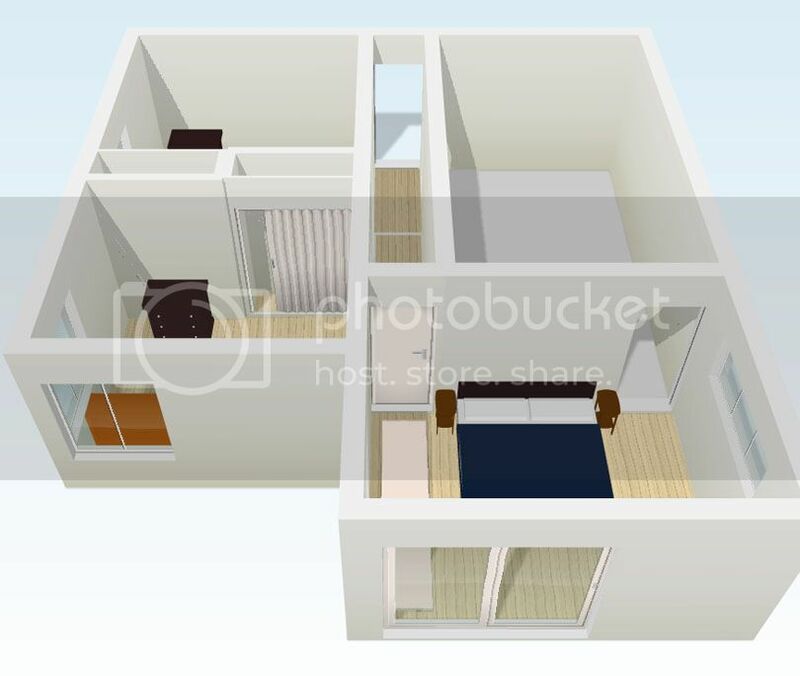 I have one in the floor plan, but took it out in the 3D drawings below. So, here is the basic layout of the back of the home. The hallway leading to this portion of the house is right by the door that leads into the garage now (and it will soon lead into a narrow laundry room, which will open into the garage). Our patio wraps around the entire home, which is one of the reasons we loved this house, and you can access it through our room, plus the sliders in the three season room. Those strange squares in the hallway are skylights, which we will be keeping, and the master closet/bathroom will only be accessible though our room. There will be a built in linen closet in the guest/kid bath, but not in ours - we didn't want to take up the space, and will keep our towels & bedding in our own closet, since we're making it larger anyway. Eames will have the bedroom with the two windows, and we will set the other with a guest bed & our desk, which will hold my work items. The closet in the guest room will also hold all of my work items, which is exactly how I store everything in our current house; in the guest bedroom's closet. And here is a three dimensional view from the rear of the house. I put a slider in our bedroom, but really those are just large windows that are stationary. The door is directly to the left of those. You will see the opening into our closet - there will be no door into the closet, just a walkway, and there will be a pocket door into our bath. Here is a better view of the two other bedrooms. Enough space to play and sleep, but not too much where we collect a lot of crap in our rooms. We are excited! And here's a view of the bathrooms & our closet. We have decided on narrow, custom vanities to fit the space perfectly. We aren't quite sure on sinks yet, but have decided on double vanities for both bedrooms, which means we are buying four sinks and four faucets - which didn't really occur to me until I was looking at them last night online. OY! And that random glass-brick wall is an old doorway that used to go out to the sideyard, but has been boarded up for the past 20 years. Since you can tell on the outside that it used to be a door, we decided to glass block it for two reasons - a.) we needed a window in that room anyway, and b.) since the outside is Roman brick, which we don't have any more of, I didn't want to try and "patch" the outside and put a window on the upper half. So, instead, we're going to make it a glass brick wall. Fabulous. I really like the way you've divided the space. The bathrooms look plenty generous to me! One question -- why a double sink vanity in the kids' room? Seems like one sink would be sufficient in a kids/guest room bathroom (or is it for the benefit of occasional "couple" guests? ).